I remained as if hypnotized by his powerful stare; his eyes bore into me, as if piercing my soul. The right side of his face was flawless but the left side was hidden by a white alabaster mask. His skin was remarkably pale, with lips that were rich and full, and not like that of a ghostly apparition at all. I felt my pulse quicken, my hand reached for my throat and I attempted to force the words out that were trapped within me. But I was unable to form the words I wished to speak. My entire being seemed frozen in time, and it occurred to me that perhaps he was a specter that held me in a dark spell. I watched helplessly as he took a step backwards and swept the length of my form. I felt ravished by the intensity of his leer; it was possessive and arrogant, as if I was nothing but a mere piece of property belonging to him. I was ashamed of the arousal it triggered within me, the color rose swiftly to my cheeks. I was both frightened and astounded that this specter, this lone being, could invoke such a primal urge within me. In one elegant move, he spun forcefully on his heel, the long black cape rising and floating in the air behind him like a cloth of silk caught in a gentle breeze. The specter stopped in mid-stride and turned his head toward me one last time, the unmasked eye boring into me and exposing my thoughts. Then he vanished into the dark passage and left me standing alone. There was a feminine mannerism to his movement and I was enthralled by his mysterious allure. I regained my composure, the spell broken with the rattling sound of metal touching glass. It was the lantern I held before me shaking violently in my grasp. I brushed a strand of hair from my eye and swallowed deeply suddenly finding the courage to speak. "Wait, Monsieur." I called out. The words echoed loudly along the dark stone walls, but it was too late, for the specter had evaporated as if into thin air. I held the lantern in front of me, and slowly walked in the direction where he had vanished. I followed the long winding narrow passage until it ended in a solid wall. A dead end, the passage appeared to serve no purpose or intent. I examined it carefully, for surely there must be a latch or keyed entryway. Simone leaned against the wall, her heart beating wildly, the sound of a horse galloping in her chest. Small beads of salty liquid formed on her aristocratic brow, and she allowed herself a moment to gather herself and regain her senses. The sound of Lady Janaway's muted footsteps approaching from the other side of the wall caused her to hold her breath. Hidden in a parallel passage behind the wall, the false entryway had allowed her to make the narrowest of escapes from Janaway. Simone chastised herself for her foolishness. Having lived in the catacombs unmolested for so long, she had grown arrogant and failed to recognize the danger of revealing her sanctuary to the outer world. Simone's knowledge of the catacombs had served her well in her escape; the secreted passageways throughout the house permitted her to vanish into its shadowy depths like a phantom. As she listened, she heard the woman fumble along the walls looking for a method of entry. Simone was astounded by Janaway's tenacity and prayed silently that the she would not discover her. Simone recalled fondly the enigmatic woman from twenty years ago. The way a young Kathryn Janaway would sweep into a room and control it with a mere stare. There was a haunting allure coupled with a hidden formidable strength. Simone was a mere child of eight and had grown to admire Kathryn desperately from afar. She found herself completely enamored with the earthly goddess image of Kathryn Janaway. The intense blue eyes with flecks of gray that now viewed her with such compassion and warmth were those she remembered from her youth. Simone always felt alive when in the company of Kathryn Janaway. She had often invented excuses to visit her father at the house, just so she could gaze upon the young English beauty. Kathryn Janaway had always created a powerful affect on Simone. As a child, Janaway made her feel human and wanted, a member of society and a part of humanity. Janaway never made Simone feel like an object, or focus her attention solely on Simone's unique voice as her parents had done. Instead, Kathryn had made Simone, as young as Simone was, feel like a person, and treated her with the utmost kindness and respect. Simone recalled the great distress she had suffered, shortly after the death of Mademoiselle Brigitte, when Kathryn's parents had taken Kathryn away, her family removing her to England and out of Simone's life. She had cried silently the day Kathryn Janaway was taken away from her, and, in an unexplainable way, a part of her tiny heart died. Now at the age of 28 years, the shock and fear of seeing Kathryn Janaway again after all this time thrilled her greatly. She felt excited, enchanted, and completely speechless, no different than when she had been a child twenty years ago. As a woman, Simone, was now overcome with the desire to touch Janaway, to run her hand down the elegant and flawless face, a face of beauty barely touched with the passage of time, to make sure that Kathryn Janaway was not a dream or apparition, but the same beautiful goddess she had worshiped as a child. Simone watched as a tiny cloud of mist formed about her labored breathing as the cool air of the night met her warm breath. She stood frightened, and her chest rose and fell uncontrollably. Simone could not fully explain how Lady Janaway happened upon her. The now familiar hidden tunnels and rooms in the bowels of the Opera house endangered forever. It was here that Simone had found solace, the place that kept a cruel and callous world from harming her. It was at risk now, her sanctuary, at risk of being discovered and taken away from her, and her human frailties would be laid bare for all to see. Simone cared not that she was thought of as the phantom, a specter to be feared and hated. Better to be feared and hated, than spat upon by an ignorant, dispassionate and hypocritical world. She subconsciously touched her left brow, the hideous scar from her accident hidden beneath the mask. It was the moment that changed her life forever ten years ago, forcing her to seek refuge in the dark cellars of the house. She had welcomed the darkness and reveled in its cold comfort. Its shadowy existence sustained her. The scurrying rodents that once startled her soon became a familiar and almost welcome presence. They were part of her dark family, and like her their nature was aloof and solitary. Their very existence prompted the disgust of mankind and struck fear into the hearts of many. Simone created a new existence here in the dark depths, ignored by society she had lived here for five years past. The manuscripts and works of art she collected replaced the family that had disowned her. The objects were harmless and unassuming, at one with her own inner being, so unlike the hurtful humans of the outer world, she came to abhor. The words written on pages and images on canvass were a reflection of the harmony she sought, each object was perfection in its purest sense, each joined in unity and was a part of her, together they formed a single being, one life. She returned to the memories of five years ago, to the time when she was first forced to descend into the shadowy depths of her dark world. The evening before she was to be sent away by her father, she had heard her parents argue about her fate. Her father wanted her cast into the forgotten pit of the mad and deluded by having her committed to an institution for the insane in the south of France. Her mother wept for her only child but lacked the courage and strength of will to defy him. Her mother's pleas had gone unheeded and the arrangements were already made. The coach from the institution would arrive in the early morning hours and collect her, thereby ensuring that the neighbors would not gain knowledge of the stain upon Monsieur Santerre's good name. He was ashamed of Simone and had never once spoken her name since the night of the fire. "It is a decent place", she overheard him saying, "and when she has one of her spells, they can look after her properly. She will be able to rest and find peace of mind." He spoke in his hypocritical voice, her mother whispering her pathetic agreement. After the accident, Simone was a broken doll, no longer the treasured beauty to be placed proudly in the Santerre display case. She was nothing, a mere piece of rubbish to be discarded by her parents. She felt the bile rise in her throat and instinctively swallowed deeply. The memories of that time were painful and difficult for her to bear even now. The indifference of her parents tore into the very fabric of her fragile soul. Their looks of disgust at her disfigurement would be etched into her memory for always. She was the horror they could not stand to view, and therefore behaved as if she no longer existed. Simone had decided to escape the fate her parents had in store for her, and using the shadow of the night to conceal her departure, she left the Santerre home forever, never once looking back. Knowing of no other place to go, she found herself at door of the Opera de Paris, the only place she felt comfort and safety. She recalled its hidden cellars from her explorations as a child, and like a shadow in the night, she slipped into their murky depths. Thus on the evening of April 6th 1893, precisely five years ago, Simone Armande Santerre died and the Phantom of the Opera de Paris was born. The Phantom built her own world in the cellars of the Opera de Paris and found it to be an acceptable life. The darkness became her mother, the solitude her father, the work of arts her friends and the lake her savior. The writings and music allowed her to maintain her sanity: here she could find peace. In the early day's she broke every mirror she happened upon, unable to view the hideous scarred image peering back at her. She continued to suffer from seizures and in time they too diminished in frequency; it was rare when one would strike and take possession of her. Simone's fought valiantly to control her labored breathing, though Lady Janaway could not possibly hear her through the thick stone wall, she was frightened of the woman's intelligence. Fraught with concern, she trembled with anxiety, she felt the onslaught of the tremors, the first sign of a convulsion. Its violence took her by surprise, for it had been so long since she had suffered such indignity. A part of her mind could rationalize and identify that it was not real, while another part could not resist falling victim to its power. The attack held Simone in a paralyzing grip and soon she felt a burning sensation on the scarred tissue of her face. Her breathing became reduced to a mad pant and she doubled over as if in great agony. Distressed and trying to collect her breath, she removed the mask and tossed it aggressively from her person. The delicate porcelain object broke into two, its distorted horrid visage mocking her. As she turned her countenance from the hideous vision, a low mournful mew escaped her lips and she slipped to the cold stone floor weeping silently. Her left hand reached up and covered her scarred brow protectively while with the other cradled her stomach. The tears trickled slowly down the phantom's cheeks and she knew what would follow next. The seizure struck her with a cruel brutal force and her body began to tremble violently in striking waves. She could smell it, smell her flesh burning. Then came the pain and the fear and horror of the fire of years ago. The pain took hold and rendered her helpless as the feeling of a white-hot poker entered her soft flesh and burned deeply into her bone. A convulsion shook her and lurching forward, she landed on all fours like a beast, the contents of her evening meal spilled forth and Simone gasped wildly. She stared in despair as her left-gloved hand became engulfed in flames before her. In a mad hysteria, she removed the garment and tossed it to one side. Her fevered delusional mind watched as it burned to a pile of black ashes. Her damaged hand shook as if stricken with palsy, she willed it to stop, but it would not. Unable to foster the seizure's horrific imaginary assault, she wept aloud and after a long torturous hour, the pain began to ebb away and with it the false memories that had invaded her mind. Simone finally rose from her position on the floor and attempted to assume her spectral persona, but she was shaken and ill at ease. She looked upon the items she had torn from her person at the height of her hysteria. The porcelain mask laid broken in two, not hideous or mocking at all. The white silk glove was intact, if not slightly soiled. She hated that her mind could play such tricks upon her, to leave her feeling weak and human, small and insignificant. Breathing in deeply, she sought to dismiss the seizure. In a rush of anger, Simone ran silently through the gloomy unlit passageways and deeper into the recesses of the caves until she came upon an open archway where the lake existed in all its tranquil beauty. She threw herself into its bountiful waters; the numbing affect stopped the beating of her pounding heart. Her mournful cries reached into the harsh watery depths and she felt the lake's healing powers overtake her. She remained there until her body shook with a violent chill, her teeth chattered and her lips had turned the darkest shade of blue. The cold had taken away the pain and fear brought on by the seizure. Simone stood erect, left the dark cold waters, and retreated to a second room filled with discarded clothing. Removing her wet garments, she attired herself in formal black evening clothes worn by men and placed a long dark ebon cape around her shoulders, the lining a deep sapphire blue which matched her eyes. Lady Janaway believed her to be a male, a castrato. It would be wise to continue the illusion the Lady believed, Simone thought to herself. Sorting through various masks, she settled upon one made of gold that resembled a sunburst. Placing it over her face, she proceeded to walk in the direction she had first came, a delicate but cruel smile etched on her lips. I spent the better of an hour seeking the means by which the specter had made his ghostly retreat, but I failed, and actually considered that he was a restless spirit after all. I returned to the great room and began to examine its contents. It made of little sense to me why a specter would require such earthly possessions, and I quickly reached the most logical conclusion, that he was a true being made of flesh and blood. Though I could not say with certainty, I placed his age at twenty-eight or perhaps thirty years. I also knew he was a castrato, with a refined powerful voice, well-trained and versed in Italian opera. While castratos were not rare among opera companies, there were fewer in number than tenors and baritones. It would require a considerable amount of time and research, yet I felt confident I would be able to determine the specter's human identity. I examined his lair looking for evidence of who he could possibly be. The room was immaculate, and each item had been positioned with the utmost care. His taste for art was of the new period, Impressionist. The distorted features of the portraits, twisted in pain or brooding disturbed me, and I felt saddened to the deepest regions of my heart. He possessed hundreds of manuscripts, writings of science, art, social publications and literary classics. I smiled inwardly at the irony of it all, for truly this was the most well versed and intellectual specter that ever haunted a house. I was relieved to discover that the specter was indeed a man of flesh and blood. Yet, I still felt some concern and apprehension, although, for some reason, I did not fear for my life at all. There was a tormented look to his eyes, a soul in pain and displaced from society. The victim of an unspeakable act, one that left him internally scarred, untrusting of the cruel world around him. Where did such a person truly belong? A man not quite a man, and yet no longer a boy? What world would not look down upon him in disdain? A man, that possessed a perfect angelic soprano voice. I pondered if it was possible that such a person could have sent three men to their deaths. What of this preference for wearing a mask, was it to produce the appearance of a ghoul? Why did he live in the abyss of these dark catacombs beneath the house, sequestering himself from all of humanity and living instead in solitude and destitution? What was the specter hiding from and what dark secrets did he possess? My deepest instincts spoke to me of his sorrow, a tormented life filled with loneliness and grief. There was something about the specter that drew me to him and I yearned to reach out and ease his troubled spirit. To return him amongst the living and allow him to embrace life anew. I decided to learn all that I could of this specter and do everything in my power to bring him back to my world and to humanity. Although the hour was late, I felt alive, exuberant and thrilled at the prospect of a new and challenging adventure. For the first time in twenty years I felt my soul breath, a new fire burned within me and my eyes sparkled with a brilliant gleam. I must be careful and prepare a well thought out plan to reunite with him once more. It was the next morning and I arrived at the house with a new urgency and immediately sought the company of John Paul. I wished to speak with him regarding my encounter with this specter and to see if he could shed some light on the specter's true identity. I knocked softly on his door and found that he was not yet in. I scribed a note and asked that he see me at once, that the matter was of the highest importance and needed his immediate attention. I headed in the direction of Madame Dumas's room for who better than she to remember the history of the old house and all of the singers that had graced its magnificent stage. I found Madame drinking her magic brew and consuming the last of a croissant. The rich aromas filled the air and I was embarrassed by a most undignified sound that came from my stomach. Madame Dumas smiled at me, her eyes twinkling with laughter as she ushered me to the chair I had occupied the evening before. She offered me a cup of coffee and deliciously smelling fresh baked croissant. "Kathryn, what has occurred that you have a new fire in your eyes." The Madame scrutinized me with a keen eye, waiting eagerly for a response to her query. "I saw him. I saw the specter last night." A small gasp came from the back room and a startled Giselle rushed towards us wringing her hands in front of her. She blurted out her words before Madame Dumas could comment any further. "You saw him Madame? You saw the demon?" "I assure you Giselle, he is not a demon." "Who is not a demon?" We were interrupted by the soft response of John Paul who stood in front of the doorway. "Good morning, John Paul, I gather you received my note?" "Your note or your summons, Katrina? Oh, Madame Dumas, I would be beholden to you if you graced me with one of your delicious cups of coffee." John Paul entered the room smiling broadly and eyeing the delicate pastries with relish. He took residence in the chair next to mine and searched my face for a clue. I was able to detect his nervousness and assumed he grew concerned about my comment regarding the specter. For some reason I could not quite explain, I decided to keep from him the knowledge I had gained from my encounter with the specter. I elected instead to illicit as much information as I could from him without giving him cause to inquire into my sudden interest in the history of the Opera de Paris. "John Paul, I wondered did you or perhaps Maestro Santerre, ever hire a castrato in your company?" Madame Dumas handed John Paul his coffee, her wise eyes locked on to mine and she searched my face. I lifted my chin and smiled warmly at her, hoping to deflect her scrutinizing glare. John Paul looked up from his coffee, his face quizzical. I was able to establish that he harbored no suspicion to my innocent yet odd query. His brow furrowed, and he searched his vast memory. "A castrato? No, we never contracted a castrato on a permanent basis. However, I do recall a most remarkable young man, an Italian. I hired him to play a minor role in one of our productions, but that was so long ago." "This young man, did he have a name?" "Katrina, you are not considering replacing Mademoiselle Forte with a castrato?" I could not stop myself from laughing aloud in a most undignified fashion, and much to my dismay, I succeeded in making a complete spectacle of myself by spilling the contents of my coffee onto my lap. Giselle, bless her soul, immediately came to my rescue and with a clean cloth wiped the stain from my skirt. To my relief, my companions sought not to add further to my discomfort and embarrassment by bringing further attention to my slight indiscretion. I regained my composure and looked at John Paul who quickly turned his vision from me in an effort to contain the laughter that threatened to ensue. Madame Dumas turned her back from me as well, and I could see by the movement of her shoulders she was laughing. Ignoring the deplorable lack of etiquette I had displayed, I focused my attention on John Paul. "No, of course not, although I must admit it may prove to be an improvement. I have my doubts about Mademoiselle Forte's abilities, but I have not made a decision to replace her. My question is more out of curiosity, for some reason I found myself thinking of castratos this morning. "I see", answered John Paul in a controlled and level voice, though his eyes still contained a hint of suppressed laughter. Madame Dumas turned to look at me after managing to control her mirth, and eyed me with a quizzical smile. "I believe his name was Massimo DeNorte and if memory serves me correctly, he is a man of about thirty." "This DeNorte, was he a handsome man?" "Yes, as far as men go I suppose. He was of tall stature, lanky, not with a tendency to corpulence like most opera singers. He had hair the color of golden corn and dark blue eyes. His face was feminine, as is to be expected in his case." "When did he last sing here?" "It must have been at least five years ago, if not longer. As I said, he was a minor singer and only employed temporarily. His voice had an incredible range, it was as if it emanated from an angel." "Do you know whatever became of him?" "One other thing, was there something wrong with his appearance, his face to be exact?" "No, none that I recall, he was quite beautiful in fact, and from a distance could easily be mistaken for a woman. Why do you ask?" "Nothing really, I was just curious. Do you know if he is still performing?" "Of that I do not know. He was a gypsy, Katrina, that enjoyed roaming from house to house obtaining whatever employment he could." "I am not sure really. However, it occurred to me he preferred to live his life that way." "Thank you, John Paul, you have managed to resolve my curiosity, you are a dear." "Is this what you wish to speak with me of?" "Yes, and to tell you another disaster has befallen the production. I was informed this morning one of the stage sets for act II of Danse has been sabotaged." "What say you? Sabotaged, by whom?" "If one listens to idle gossip, by the phantom." John Paul paled slightly and I was alarmed to see the confusion in his eyes. He stood and placed his cup on the table. "I must address this issue immediately and I apologize for any inconvenience this has caused you Katrina." "It is quite all right, John Paul, no need to apologize. I am beginning to suspect this production is cursed." The plate Giselle was holding dropped to the floor smashing into small pieces. She apologized profusely and crossed herself at the same time. I was amused by her actions and for a moment thought of telling her the truth, that the specter she feared so fiercely was none other than the castrato, Massimo DeNorte. The days quickly passed and brought one mishap or misfortune after another. The production was fraught with problems, and diva Forte did everything in her power to misrepresent the role of Constantina. During one of her rehearsals, she was nearly struck dead when a counterweight came crashing down within two feet of her. Although I was concerned for her safety, I silently wished she had fallen victim to it and saved me the agony of hearing her destroy the gift of love I had created with my dear late departed husband. I was certain beyond a shadow of a doubt, Richard sat in his grave holding his hands to his ears each time Mademoiselle Forte sang one of his magnificent arias. My mornings were spent resolving one problem or another with the production of La Danse, while my evenings were consumed with locating the specter, DeNorte. I was certain he was responsible for all of the unsavory acts befalling my production and I was angered by his malice. I roamed the catacombs below and ventured further into their depths marking the walls with a paint in order to find my way back. I had little doubt Monsieur DeNorte was still living within them and that he, and he alone, was responsible for the calamities that occurred in the Opera de Paris: I was determined to put an end to them. I found it difficult to sleep at night, the image of his azure eyes boring into me and keeping me awake. I became obsessed with him and, although I refused to admit it, I grew excited at the prospect of our next encounter. Of one thing I had learned about the catacombs, they were an endless maze with multiple secreted rooms and hidden passages that connected to every level of the house. It was late in the evening, a forth night since my encounter with the specter. I sat in my office completing the last of the changes to the fourth aria in La Danse. The days that past left me short of temper and I found I had little patience for anything at all, especially spoiled, ineffective divas. The disturbances and disruptions caused by the specter DeNorte created havoc and superstitious fear amongst the entire company. An atmosphere of panic descended and a few of the minor singers left the production frightened for their lives. I was ill at ease and tired so I poured myself a soothing cup of hot coffee. It was then that I heard it. The very same aria that the specter DeNorte sang on the night of our encounter, it came from within the walls. I rose quietly and quickly opened the closet door and listened intently. As before, the music permeated through the walls and so I reached for my lantern and headed towards the cellars. As I neared the room that housed the massive organ, I lowered the lantern's wick to a very dull flame. Walking on the toes of my feet, and without making a sound, I continued forward until I reached the room. He sat in front of the organ and his face was raised upward, the beautiful rich voice filling the air. I watched until he was near completion and I moved closer to him. At the conclusion of the aria, he ceased playing and remained perfectly still. I chose the moment to clear my throat. He rose quickly and turned to face me. I stood a mere foot away from him and grasped his arm before he could depart. Much to my amazement he froze in place, and stared at me as if I was the ghostly specter haunting the house. I was startled by the intensity of his stare, and disciplined myself to regain control. I looked deeply into his eyes and, for the briefest of seconds, our souls seemed to touch. The specter DeNorte stared at me as if I was completely mad and gazed deeply into my eyes with his hypnotic leer. I tightened my grip on his forearm and was surprised to discover his body was firm and not the least bit atrophied as I assumed it would be. I felt his muscles tense beneath my grasp and he looked upon my hand with great contempt. Realizing I could easily lose control of the situation, I sought to close the distance between us. I took another step forward until my face was but an inch away from his. Since he was taller than I, I was forced to raise my head upward to look at him. I bestowed him with one of my sternest looks, the kind that usually had the effect of making those in receipt of such a look, tremble in their boots. He flinched as if wounded, and I dug deeper into his arm to ensure he remained in place. 'I believe I asked you a question." Reinforcing my previous query with a low deadly growl to my voice. His gaze swept over me and before he responded he looked directly into my eyes, a stoical look was conveyed in them. "If you say so, Madame." His voice though pitched low was lyrical like that of a woman's and I found its level soft and sweet. I felt my hand afire where it met his arm, and his muscles flexed once more, which I found to be rather seductive. "You misunderstand, Monsieur, that was a question I asked and I expect an answer." I placed as much command and force behind my question that I dared. My eyes never once left his, and I studied them with a deep intent for any falsehoods. To my amazement, I saw a hint of fear flash quickly across his eyes and he raised his chin arrogantly at me in an attempt to disguise his discomfort. He straightened his posture before responding. "It is you that assumes I am whom you think. 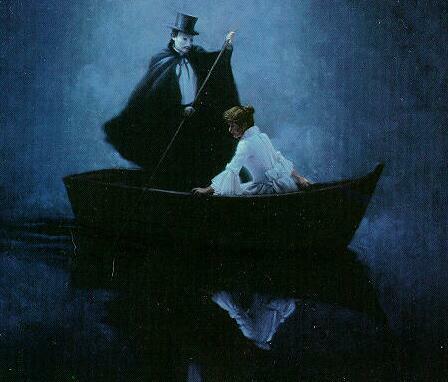 I am but a phantom, Madame, a specter." "Very well, if this is the game you choose to play. I can tell by the feel of your arm beneath my hand, you are made of flesh and blood. Am I not correct in establishing that you are a human and not a specter?" My answer was less of a question and more of a statement. I knew that if I wished to gain the advantage with this arrogant man, I must maintain control over our conversation. "The evidence you hold within your hand is all the answer you require." "Do you deny you are Massimo DeNorte?" I have no name, Madame. I am simply referred to as the specter. The Phantom of the Opera de Paris to be exact." "Your title, Monsieur, is the misguided superstitious assumptions of a troupe you have succeeded in frightening. If you are not Monsieur DeNorte than what name do you go by?" "I left that life behind me, Madame, when I sought the comfort of these cellars and with it, I left all semblance of human labels." "Very well, I can see you have no intention of making this easy for me, Monsieur. Therefore, you will do me the favor of removing that mask, so that I can see for myself if you truly are Monsieur DeNorte. It would serve to prove your claim will it not?" I felt his entire body tense at the thought of my suggestion. He removed my hand from his arm delicately and held onto it lightly. "I am afraid, Lady Janaway, I can not honor your request. You say that I am Massimo DeNorte, who am I to dispute your claim." He bowed his head elegantly at me in acquiescence. "So then you admit to being Massimo DeNorte, a castrato that sung here five years ago." "I am whom ever you want me to be." "Why are you sabotaging my production and why do you live here in the cellars of the house?" "I live here because this world of darkness suits me, and it is where I am one with the universe. The world that I left behind me failed to hold its allure. In this world there is no madness, Madame, nor people with their pious pride." "Why do you seek to destroy my production when I have not caused you any harm." "You are a very presumptuous person, Madame, and like the rest of the world, you hide behind your piety by disguising it in a cloud of self righteousness and justification for your actions." "How dare you speak to me so. It is not I who hides in the shadows like a pathetic creature of the night. Nor have I ever brought harm to a living thing or the property of others. I have always had the deepest respect for those around me as well as the things they possess." "Have you, Madame? And what of your late husband, Lord Janaway, did you give yourself to him as you did your lover before him?" I felt as if a blow struck me in the face and my breath caught. I was angered by his blunt remark regarding my husband and ashamed that what he spoke was the truth. I was stricken by his arrogant words and it showed in my appearance. "What truth do you know of the love I had for my husband and how dare you speak of my past. You have no right to speak to me so casually and with such familiarity. You neither know me, Monsieur, nor have I ever given you permission to speak to me in such a fashion." "Yet in your own arrogance you speak to me as if you had every right. Tell me, Madame, the rules of which you speak, they do not apply to me? Or are you so blinded by my meager surroundings you believe you are above me and can malign my character as you wish?" I was stunned by the words that he spoke to me and I felt them pierce my heart. As angered as I was by his sheer arrogance, I could not dispute that what he said was the truth. "Very well, Monsieur, please accept my apologies for my presumptions. I was in error in having judged you. Surely, you must understand that you have been seen in the vicinity of these accidents. You can see that it is easy for someone to draw the conclusion that you are the one responsible." "Your apology is accepted, Madame, and I assure you I am not the one responsible. I may be a phantom, a specter or this Massimo DeNorte you speak of, but one thing I am not, and that is a liar. You will find, Madame, I am not given to falsehoods, it is something I am incapable of practicing." There was a pleading in his eyes that led me to believe that he spoke the absolute truth. Monsieur DeNorte's only crime was that of arrogance, and it was that same arrogance which forbade him from committing falsehoods. "Then if you are not the person responsible, then who pray tell is?" "I cannot answer that for I do not know who it can be. You say that I was seen at some of these 'accidents' as you call them. May I ask by whom?" "By many. Several stage handlers saw you above in the rafters when the counterweight was cut and nearly killed Diva Forte." "I see. I assure you I was not the one responsible for this act, nor any other that you speak of. On the contrary, Madame, I find La Danse to be an adequate opera, despite Diva Forte's insufficient talents." I suppressed the first thought that entered my mind, for fear of behaving in a manner unbecoming a lady. Instead, I found I was bemused for it appeared that this specter considered himself an authority on Opera. "A high compliment coming from such an authority as yourself." I knew I was being sarcastic in my manner of speaking, but I saw fit to place this arrogant young man in his place. "I am well versed and educated in every opera ever written, Madame. You are correct in your assessment, I am an authority on opera and many other arts and sciences. I have an extensive education to draw upon. Perhaps you should consider replacing diva Forte, she is incapable of performing the demanding vocals required and will only fail in the end. You will find that it will be a futile attempt in trying to make a singer of her. Her voice lacks the proper discipline and expertise in range." "Tell me, Monsieur, have you always been so forward in your critiques?" "I only speak the truth, Madame. Do you not believe me?" It was then I determined DeNorte was an honest and noble man, incapable of distorting the truth. However, one could easily mistake his demeanor for one borne of arrogance. I was able to detect it was only his intelligence and expertise in many things that allowed him to behave in such a blatant fashion. "What of the opera itself, do you have any opinions on that?" I surprised myself by my query and yet for some reason his opinion mattered to me, something, which I was unable to explain to myself. "Yes, I do not believe that you should alter your music to fit the singer. Your opera was written for a mezzo-soprano with a variant range and strong projection. By changing the ranges to suit Madame Forte's limited octaves you will not achieve perfection. You will only succeed in creating a failure." I was impressed by his grasp of music in both its composition and performance. It was obvious to me that DeNorte was well schooled. "Where did you receive your training Monsieur? Who taught you musical composition? "As for my voice, I was trained in Italian opera, by more than one instructor. My mastery in composition I learned from my father when I was a mere child." "Your father what is his name? Would I know of him?" "My father was a driven and arrogant man, Madame, and I do not believe anyone really knew him." "Is your father still alive?" "He is not, he died quite some time ago." "I am not, as I said, my father made me into what I am." I realized, with great embarrassment, my poor judgment and cursed myself for my breach in etiquette, for surely his father was the one responsible for Massimo being conducted into the realm of a castrato; it was the cruel and brutal nature of my art I most despised. I found it to be a most heinous crime to deny any man the right to his own manhood and control over his own destiny. The young boys given callously to the church were castrated at a young age in a distorted and deplorable act to preserve their soprano voices. I was sickened to know that such an act was visited upon the handsome young man that stood before me. In a strange and profound way, a castrato was no different than a woman in this day and age; neither was in control of their own destiny. We were very much alike, Massimo and I, trapped in a world with little power and control over our own destiny, though I was one never to bend to the will of others. I did learn through diplomatic means and by using my feminine guile to shape a world that I found neither oppressive nor unbearable to endure. I was fortunate in having been married to a man like Richard. An intellectual with little regard or concern for a strict and strangled society that viewed women as objects to be displayed like a prize. In Richard, I found a less restrictive lifestyle and one that did not easily fit into a nineteenth-century world. I, in turn, respected the life he gave me, by never embarrassing him in public and paying heed to our surroundings when entertaining. Over the years, I perfected the art of making my views known in a most inoffensive manner and which were cleverly stated to avoid embarrassment to either one of us. It was my impression that DeNorte's life was not unlike mine, and his suffering was evident in his face and voice. I felt an attraction to this troubled soul and an unexplainable tenderness to his situation. "Please forgive me, Monsieur, I did not mean to bring such unpleasant memories to you. I apologize for my deplorable insensitivity and I hope that somehow you and I can become friends." I saw his features soften at my words and a quiet warmness caressed his alluring azure eyes. He nodded his head to me in a graceful motion and I saw how he thought carefully before responding, his bottom lip no longer pouting, but rather trembling with the great emotion he sought to suppress. "There is no further need to apologize, Madame. I am neither offended nor alarmed by your statement. I am unsure if I can offer you my friendship, for you see, I have grown accustomed to my world and yours is one I left many years ago. It is here where I belong, and you, Madame, are a part of the world above." "Why must you remain here? Why do you not join the living world above?" "It is among the living I do not wish to be, Madame. Not everyone is as caring as you are. They would not understand someone such as me, I am a demon, Madame, a horror that the world cannot look upon without experiencing disgust." His voice was unsteady and broken like his spirit. The words he spoke were filled with hurt and disdain. I could not help but feel my heart break as he spoke, and I promised myself to help this poor creature that felt the world had turned its back on him. "Tell me, Monsieur, why do you wear a mask? What is it that you wish to hide?" "We all have something to hide, Madame, some more than others. Some hide a broken heart, while others hide their ugliness in the outline of a smile. I chose to hide my ugliness behind this mask." "I see that I have caused you distress with my question and it was not my intent. You have my word that I will not pursue this matter any further. However, there is one other question I wish to ask if I may, I find that your response would give me peace of mind." "Are you responsible for the three deaths in this house, Monsieur?" I watched for his response and saw that his body and mannerism did not belie that he was speaking the truth. "I am not responsible for those deaths, but tell me why do you say three? It was my impression that only two deaths were credited to the phantom." "I assure you with certainty it was three. The Maestro Santerre's death was of a suspicious nature. You see, I worked for the Maestro as a young girl and I can assure you he did not end his own life." "Ah, but people change, Madame, and perhaps Maestro Santerre was not the person you fondly recall." "That may be so, Monsieur, but Maestro Santerre was not left-handed and therefore he did not end his own life as has been presumed." DeNorte breathed in a sharp breath, and I watched as his face blanched and a small cry escaped his lips. It was obvious he was not aware of this piece of news and my statement struck him with full force. "How...How do you know this to be true?" "Because the young assistant dresser told me a story that was not relayed to the authorities therefore I know the circumstances in which he was found." "I must leave you, Madame." He turned from me and quickly made haste and I was helpless to stop his departure. Not knowing what else to do, I called out to him as he disappeared into the dark. "Monsieur, please wait. I wish to speak with you further." I heard his haunting response return three times as the echo filtered it back to where I stood. "I shall seek your company out again, Madame, you have my word." I stood there alone and wondered if the specter would keep his word. There were two weeks left before opening night and still I was having difficulties with diva Forte. There were days when she sang flawlessly and others when she was unable to reach the appropriate note and hold it. I realized the more attention that was drawn to her failings, the more she seemed to shrink away and sing worse. I was convinced her problem had more to do with nerves and confidence than anything else. For some reason, I intimidated her and I discovered that by treating her like a wounded child she responded more positively. In the evenings I returned to my office to go over the day's rehearsals and endless problems. Although the sabotage continued, they were minor infractions and caused little damage. On those days when rehearsals were at their most demanding, and I was fraught with despair and at my wits end, I would find DeNorte in my office. He would manage to find a way to divert me from the day's events and I would find to my surprise, a relief from the stress and ill feelings. On several occasions I ventured into the dark cellars where I would find him singing or reading. We would discuss all kinds of subjects including the rehearsals and I found his suggestions both creative and prolific, and which yielded positive results. I came to learn more of this specter and found there was a wonderful gentle side hidden deep within his being. We spoke of poetry, art, music and science. He had a small craft in which we would sail on the large underground lake and enjoy each other's company. I found these moments soothed me and brought me an inner peace. The dark world of his that I once looked down upon was very different when viewed through his eyes. There were wondrous things we discovered and I grew to care for him more and more. My early assessment of his intelligence had proved correct and I was deeply touched by our philosophical discussions. He had a sharp mind and dry wit that I found endearing and captivating. He had a way of upsetting me, but to no avail, with his arrogant manner when voicing his opinion. Yet, he could move me to near tears with a simple observation spoken softly and with the kindest of words. He was an enigma, my specter, and I grew to care for him dearly. It was on one such evening while enjoying a light supper that I decided to broach the subject of him returning to the world above. He had just finished singing, flawlessly, the latest changes I had made to Constantina's solo aria, "Nel buio della notte io trovai la mia anima". Often when in his presence, I was moved beyond words by his haunting voice and the emotion he conveyed when singing. It was as if this was his realm, the only one in which he could exist: it was in the music over which he reigned supreme. The solitary tear I wiped from my left eye demonstrated the power he held over me while he sang in his unique voice. I was moved beyond words for La Danse had been written to be sung by one such as he. It was not only the notes that he sang with masterful perfection, but also the method by which he put his entire being into the singing. One would have to be made of stone not to be moved by such an exquisite performance. The aria itself was a sad and mournful tune of self-discovery, and one of despair at the possibility of losing the love that she has found. DeNorte managed to wrap the words and music in a soft silken cloth and caress it gently like a lover's face. I wrote the aria with the thought that it would be sung in exactly the same manner that DeNorte had performed it. I was touched deeply by the gift he had presented me with, and was enthralled by the spectral persona he emoted. At this moment in time he was not of this world, but a gift from heaven with a haunting allure and magnificent voice. After a long awkward silence in which our eyes locked, I found the will to speak. My voice was low and hoarse. "Bravo, Monsieur, you have sung this aria exactly as I had envisioned it when I wrote it. You do me a great honor with your wonderful voice. Words cannot convey what you have given me." He stood and walked to me and reached out a long delicate hand wiping the tears from my face. I was hypnotized by his powerful stare and found I could not tear my eyes away from his. I felt my heart beat wildly when he lowered his face to mine and kissed me gently on the lips. Shocked that I would respond to his kiss, I pushed him from me angrily, upset that I allowed him to move me so, to invoke such feelings in me. Without saying another word, I left his company running wildly with little dignity or grace until I reached my office and threw myself onto the sofa and wept, I wept for Brigitte, I wept for Richard and even DeNorte, but most of all I wept for myself. It had been an eternity since I had felt the feelings he aroused in me and I was ashamed to be weakened by this stranger. That he could open my heart and put it on display. I tried to recover my composure and with it I closed my heart to this specter and cursed him for his alluring beauty. We had bonded he and I, and it had occurred without either of us really noticing. Yet I refused to give into it, and I took exception to his familiarity with my person. For surely it would only serve to sever my heart once more and open me to feelings I had long denied to myself. His eyes peered deeply into my soul and took possession of it, and I hated him more for it. I was stunned by this realization and disturbed greatly. I felt alive when in his presence and a belonging that I never quite had with Richard or even Brigitte. I became concerned about my mental state and determined it was wise to keep away from him forever more.